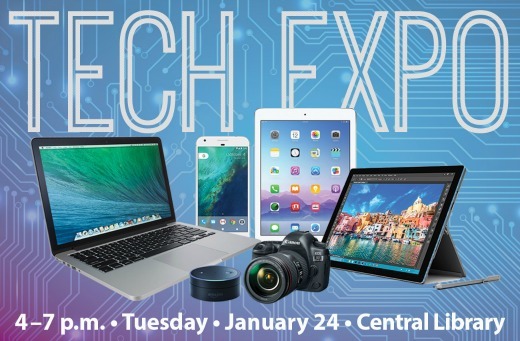 Whether you’re a tech novice or expert, you’ll find something interesting at the Mesa County Libraries Tech Expo, which takes place 4-7 p.m. Tuesday, Jan. 24, 2017, at the Central Library, 443 N. 6th St. The Tech Expo will feature demonstrations of cool technology such as robots, digital cameras, and live-streaming from the 970West Studio. You’ll be able to visit with local tech-related organizations, and you can learn about ebooks, online magazines, Lynda, Minecraft, and other virtual resources available through Mesa County Libraries. The Tech Expo is open to the public at no charge. GJMakerspace will demonstrate a 3D printer, as well as Raspberry Pi and Arduino programmable computer/robotics devices. The library’s 970West Studio will demonstrate live-streaming capabilities from the studio at Fifth Street and Ouray Avenue (across from the Central Library). The studio will be open for the public to tour and to learn more about studio opportunities. High Five Robotics and Grit Robotics, local teams that are standouts in state and national robotics competitions, will demonstrate their devices. Hands-on demonstrations of Canon T5i and GoPro digital camera kits available for checkout through Mesa County Libraries. An overview of the audio- and video-editing software available on designated iMac computers at the Central Library. A “petting zoo” of ereaders and tech gadgets available to try through Mesa County Libraries, as well as backpacks and state parks passes available for checkout from the library through a partnership with Colorado Parks and Wildlife. Tech Table assistance with cellphones, ereaders, and other devices. Presentations on how to get started with library eResources such as Overdrive (for ebooks), Zinio (for e-versions of popular magazines), Lynda, Universal Class, Learning Express, and more. For kids, the Tech Expo will offer Minecraft and Cubelet (hands-on modular robots) activities. Partnering organizations participating in the Tech Expo include GJMakerspace, the Center for Independence, KAART, Factory, Western Colorado Community College, and Colorado Mesa University. Posted in 970West, General, Kids, Library News, Teens.